Our Mercer collection has all the angles covered. It is stunning no matter how you look at it. The metal work is as beautiful as the waterfall of crystal beads and faceted jewels that adorn it. From below, the metal forms a floral design, like something you might see in a stained glass window. 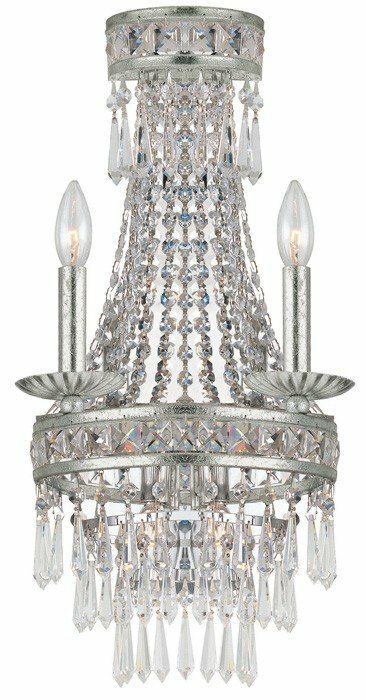 The Crystorama 5262-OS-CL-MWP Mercer collection Sconce Wall Lighting in Olde Silver uses Incandescent light output and brings Modern style. This item is 22"H x 10"W x 7"D. The total wattage is 120 and the voltage is 120 volts. The Crystorama 5262-OS-CL-MWP requires 2 bulbs. 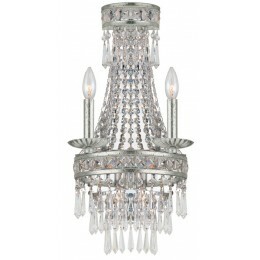 Additional Information: Shade-Clear Majestic Wood Polished Crystal.